It is so great that every year I can receive ang pau during Chinese New Year, I will save the money to buy some story books after my exam. This year I received some ang pau with beautiful design, I decided to collect it in an album as a "Ang Pau Collection album". I like to eat this rice, it contains some sesame, seaweed and some pink leaves. "Natto" a food that brings longevity. Mum bought this green tea ice-cream from the vending machine.It is very tasty! The shape look like a burger, but actually is an ice-cream, special! Japan cakes..... beautiful and delicious! Bento, luxurious set but a bit expensive, there will have a 50% discount after every lunch time or dinner time. 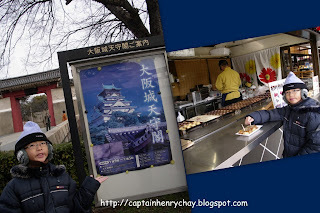 Morning, we had photo stopped atOsaka CastleWe triedTakoyaki at the park but it was too soft, the tour guide told us, if we wanted to taste the original takoyaki, we must go to the Osaka Takoyaki Museum(but we didn't have a chance to visit there, because we didn't have enough time). We went to Universal Studio, Osaka. The naughty Popeye kept on stomping towards dad when dad was trying to capture a photo for us. The Spider-man 4D effect Studio: The Daily Bugle was quite interesting. I felt like Spider-man's sidekick when I was there. It was a bit slow first but while fighting the strong villains, we had to move quickly. Sherk's 4D movie was very exciting and "Terminator" also very nice but we missed the "Back To The Future". 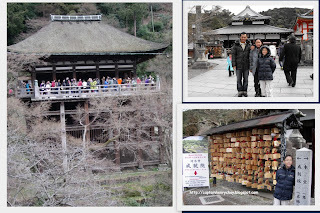 Most of the Japanese are Buddist, so they have many temples in their country. This is Klyomizu Temple. The Main Hall is the major attraction due to its broad wooden veranda which built by the wooded canyon without any bolt or nut. Uncle Patrick blessed us two ice-creams, one was green tea flavor, another one was black sesame flavor, both flavors were very tasty!! In the afternoon, we had a tempurna lunch set before we eat, we had to put the radish in the sauce for the tempura. Since tempura were all deep fried and we dip the tempura in the sauce it would help reduce some oil. It was snowing when we went to Mt.Fuji, we were only allowed to enter to the 1st station. Due to the weather, snow and mist covered the view. we couldn't see Mt. Fuji, but I liked the snow view, this was my first time to see snowing. The whole area was covered by snow. I had fun playing snowball with my friend and family. After leaving Fuji-Hakone, we visited to Peace Park, the tour guide said the best season to visit Japan is April, because there will be Sakura trees all along the street. This park also has big binoculars which allow us to have a better view of Mt. Fuji. The vending machine is easy to find anywhere in Japan, it was so convenient for all of us. I think Japanese like to drink coffee, because the vending machine has a lot of coffee choices. We bought this ice-cream from the vending machine, it was green tea flavour covered by wafer, It was very nice!